This page gives you an insight into how i have set my kayak up and hopefully some help and hints on setting yours up. If you have any advice for me or anything you feel could be added then please email me. The picture above is my kayak. 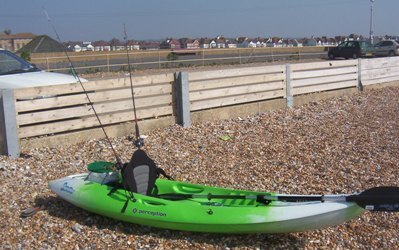 Its a scotty perception and is ideally suited as a surf kayak that i have adapted to fishing. I have added a list below of some of the equiptment I have and some of the benefits and resons why I have chosen items. You should also check the safety and kit page for advice as i have most of the kit listed on that page. The information on this page is set up as a guide only. This is an essential piece of kit for any angler afloat. It has two main benefits, firstly is the safety aspect (covered in greater detail on kayak safety page) and secondly it allows you to save any productive fishing marks you come across. I chose this model because it was full of features at an affordable price and its waterproof and floats which is a must when out on a kayak. I opted for the marine kit as it comes with a mount that i have added to a piece of wood that i put across my kayak so that i can paddle and look at it easily. 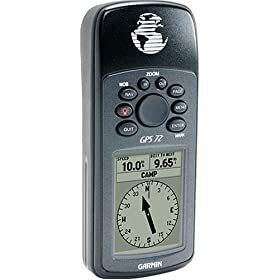 I also have a compass as back up because you shouldnt just rely on the gps. Anchor This is an important piece of kit as it allows you to anchor up and fish over one piece of ground instead of drifting. You need a strong rope and a fair distance of it. It also acts as a safety device because if your injured you can anchor up and give your position to the lifeguard using the gps and vhf. Standard Horizon VHF HX270 radio Like the GPS i view this as an essential piece of kit. Its purely for security so that you can make contact with anyone out at sea or the lifeguard if needed. The only issue with this item is that it doesn not float. It is waterproof and to ensure that you dont lose it overboard you can buy a special bag that keep the item bouyant and waterproof. Legally you will need a VHF licence to use this kit. This can be obtained through a day course and is a must. They usually cost between £50-£100. Paddle leash The paddle leash is a must for any Kayaker. It keeps your paddle attached to your kayak at all times. Without it you run the risk of loosing your paddle and being stuck out at sea. Kayak fishing seat/rod holder Whilst not essential i would recommend this piece of kit purely because when your spending hours at a time on the kayak it really adds comfort to your back. Plus the built in rod holders ensure that the rods are out of your way while paddling around. There is also a kit back on the back where i store my fishing tackle. Image can be seen at top of page on my kayak. Wet suit, life jacket, neoprene socks and seal skin socks. This lot is another must because they will help you to stay warm and protect you from hypothermia. The lifejacket will also keep you afloat if you were to fall in. This is covered in more detail on the safety page. One thing i would add is that the seal skins are totally waterproof and are excellent for use once you are out on the kayak as they will keep your feet warm and are well worth the money. Greys fish bag This is a useful item as it means you can keep your fish fresh by tying the bag to the side of your kayak and keep them in the water. It also avoids clutter on your kayak. Bungy ropes and dry bag Useful to keep items in the kayak and also for tying off to bouys/markers if you need to. Wooden plank with stands screwed on This is my home made piece of kit which im pretty pleased with. I have used a plank of wood and fixed on a Berkley boat rod stand, my gps mount and a small mount for an eco sounder. It holds everything in place in front of me and generally makes the whole fishing experience easier. The only drawback is weight so im going to trim it down as much as possible. Shakespeare ugly stick (5ft 6inch) baitcasting rod - very strong yet light. I have had some great fights on this rod and served very well when i was drifting for Plaice. At the momment im using an okuma multiplier with the shakespeare rod and its a little heavy for the rod but will do the job. New Zebco Kayak King Rod and an ABU Ambassadeur Blue Max reel (from www.abfishingtackle.co.uk). 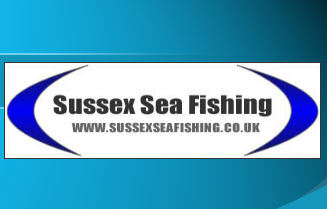 - specifically designed for kayak fishing and at a reasonable price you cant go wrong. I usually pair this lot up with one rod on a running ledger and the other one lure fishing. One point i would add is that you must wash all of your gear down with fresh water (bar the electricals) after each trip as this will prevent damage or rust from the salt. Another thing to consider is that adding equiptment to the kayak adds weight and this can effect the stability so go light but take what is needed.